As I indicated historically, I am combining posts as I need time for creating and life issues. So this post is for Sunday, Mon and Tues. In this post the focus of creativity is on artists who sketch and paint, and other creative arts, poets who write haiku and photographers who do macro photos and photographers from around the world on Tuesday. I have been busy making mini paintings for the Holiday Fair and hope to enter some more art work or photographs into a Holiday Art Event. Wish me luck. As a rule we generally receive the most incredible evening sky around sun set after there has been a storm. The above photo is of the beautiful sky that graced our presence. Hope you enjoyed the mini paintings, the haiku and the photography. Hope you will check out all the creativity at the above blogs that we are sharing with this weekend and start of the week. 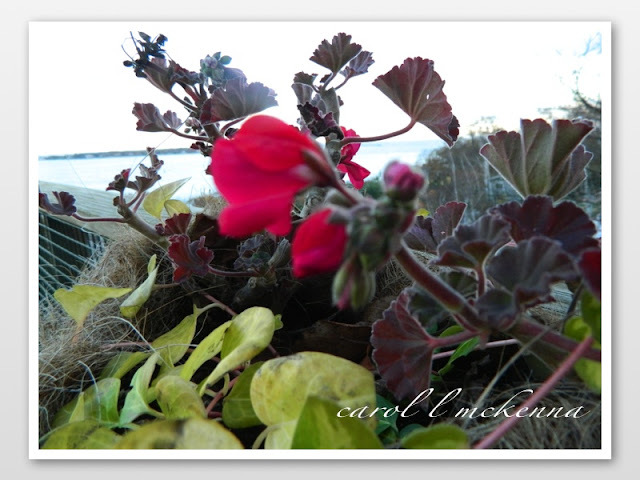 An amazing colorful post you've here Carol. Wonderfully crafted haiku ... the first one (on rainbow mystic) is my favorite. Thank you Carol for sharing your creativity with Carpe Diem. beautiful work! You don't need luck,you have talent, best wishes to you!! That sunset is truly beautiful! Wonderful array of inspiring art and images! Happy Creating. so much beauty here, wonderful! That's a good collaboration of Art, Haiku and Photograph. and an AMAZING CREATIVE MIND to assemble all of them in 1 post. Take a look at mine ..
your mini sketches are so darn cute! nice mini paintings and what a beautiful sunset! I am giving you tonnes of luck. Love your mini paintings, so cute! Beautiful photographs and "color"haikus! Beautiful and inspiring! Always something amazing going on here! Happy Sunday Sketches! Love the mini paintings! Lovely haikus and great photos!Hope all is going well! wonderful mix of art! your colorful mini paintings for the holiday fair are great! I love those little paintings, wonderful! It is lovely to see your art in mini paintings, haiku and photos - such a creativity you posses! All the best to the fair! 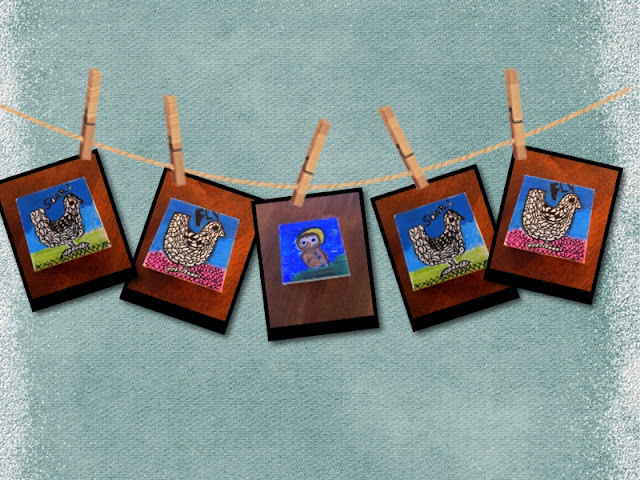 those mini paintings are simply beautiful! the best of luck with your sales dear. oh the little painting is adorable. A beautiful sunset indeed and such creative pieces you created as well. Hope you're having an excellent Sunday! Good to hear that all is well after the storm, Carol! Loved the art and poems and photos. Also that quote by Don Aslett. All good. I admire your creativity n artistic talents...what an amazing gift! Beautiful pics, thanks for sharing. 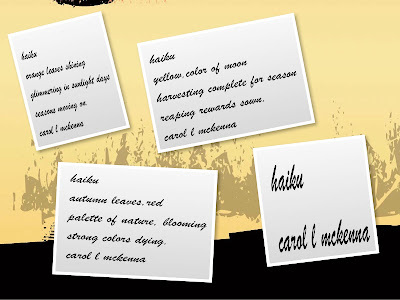 Your red, orange and yellow haiku match the season beautifully. Love your red palette of nature. Such wonderful drawings and photos! :) especially the 2nd with the piano keys I like much! and "through the glass darkly"! :) and a lovely sky! I'm glad to hear your flowers are doing fine after the storm! I suppose it was a scary event!? Hi! Beautiful captures! Through the Glass Darkly is fabulous. Carol all of your pieces are lovely. 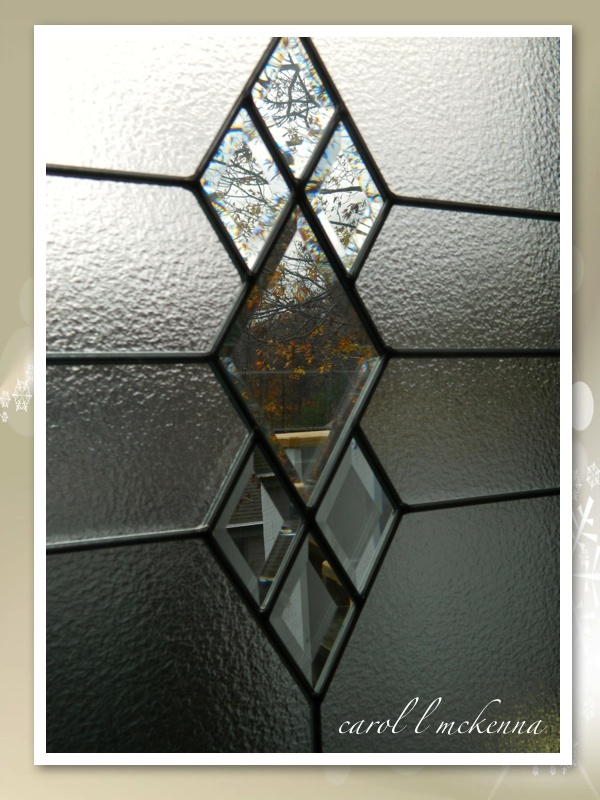 I especially loved the picture of the glass window with the beautiful fall colors behind it. Have a great week being the creative and talented person that you are! Your oil paintings are pretty, and happy Monday to you! I have a feeling that those mini paintings will sell out fast! That is such a pretty stormy sky! Wonderful little cards and beautiful photos of the nature. Great ! Have a nice new week, Carol ! Visiting your blog is always such a pleasure! Thank you so much for sharing yourself!! The oil minis are beautiful and I also like the view through the glass darkly and the geraniums after the storm. So many lovely different inspirations and apleasure for all senses. I love your mini oil creations and the glass door. Beautiful haiku and photos. Wishing you a happy week ahead. 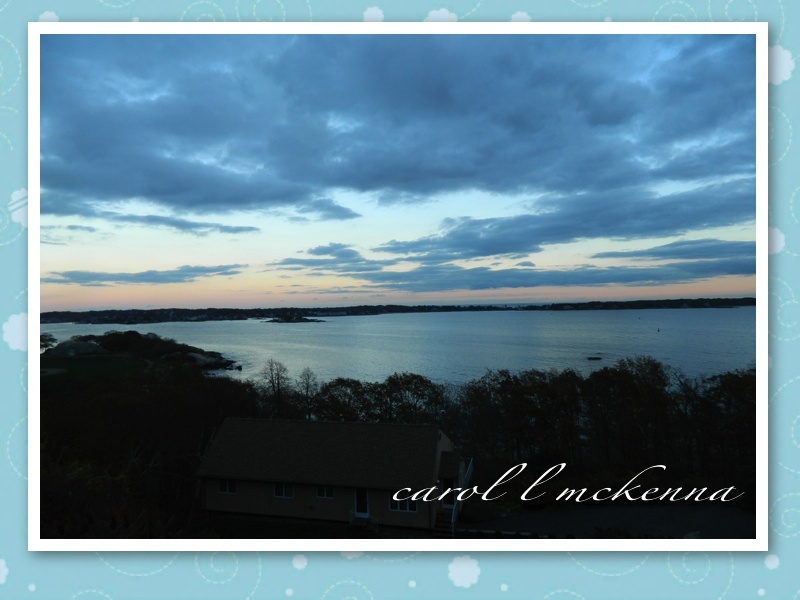 Love the evening sky picture -- gorgeous! Beautiful sky after the storm and the geraniums are great too. Love your adorable little paintings!Beautiful verses & pics! That evening sky is fantastic! Good luck with your creative endeavors. I love that interesting shot through the glass. I enjoy your combined posts. Good shots, art and poetry. I love the joyful little painting. How interesting that you get such beautiful skies after a storm -- I hope they are prophetic of better days ahead. Those are brave geraniums hanging on through all that weather and cold! A nice post, I love those little paintings. I've also been thinking about cutting back my blogging, maybe to one post a week. You have a great eye. Nice framing of your photos! Wonderful pieces again! The sky after the storm is my favorite! Nice take on 'yellow' Carol. It's a joy to visit your blog every day. Maybe you remember one of my earlier comments about 'troiku'. 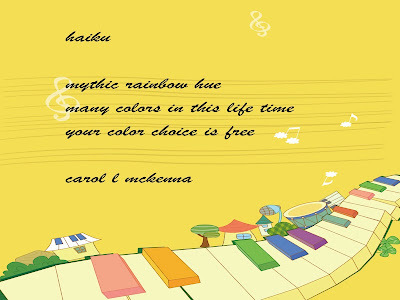 Well I have posted the Carpe Diem Preview about that new creative way of writing haiku. Wat a great post. Very inspiring. Thank you. Your mini paintings are very cute; I forgot to tell you about them. Good luck in the Holiday Art Even, Carol! They're all lovely photos. I can't pick a favorite. Yellow moons are best. Those icy white ones make me shiver! Always a pleasure to weave through your posts that combine so much creativity! love the mini oils and hope you're getting the creative time you need! I love the mini oil works! I love the holiday ornaments hanging by the clothes clip. Very pretty and charming.